This Book and I Could Be Friends: Along the shore the cloud waves break, . . . Along the shore the cloud waves break, . . . The ancient city first appeared in Ambrose Bierce's short story "An Inhabitant of Carcosa." Published in the San Francisco Newsletter in 1891, it tells of a man wandering through an unfamiliar wilderness until he comes across a graveyard and finds a stone with his name and date of death. He realizes he is a ghost and the forest has overgrown the ruins of the city where he lived, called Carcosa. 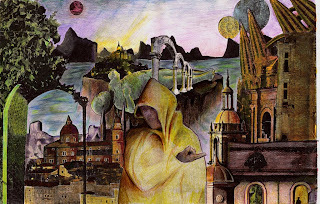 Thanks to the Cthulhu Mythos, most horror fans know of Carcosa as the setting for an imaginary play called The King in Yellow, which drives its readers mad and is connected somehow to a supernatural entity of the same name. There is also a symbol known as the "Yellow Sign," which leaves the viewer susceptible to some sort of mind control. According to the works of H.P. Lovecraft's successor August Derleth, the actual performance of The King in Yellow is a summoning ritual for the Great Old One Hastur, although most audience members would be dead by the last act. Lovecraft and Derleth may have given it a prominent place in their fictional universe, but The King in Yellow is actually the invention of Robert W. Chambers (1865-1933) and the title of a book of his short stories. Since becoming a Lovecraft fan I have been curious about the influences on his pioneering of the Cosmic Horror genre and was inspired to purchase a copy of The Yellow Sign and Other Stories: The Complete Weird Tales of Robert W. Chambers from Chaosium's Call of Cthulhu Fiction line. According to editor S.T. Joshi's Introduction, Chambers was a brilliant writer but his extensive oeuvre consists largely of sentimental, formulaic romances published for a quick buck. In fact, Lovecraft's initial opinion of Chambers, after discovering him in 1927, was that he "is like Robert Hughes and a few other fallen Titans - equipped with the right brains and education, but wholly out of the habit of using them." Having nearly finished this selection of his horror and fantasy works, I come away with the impression that Chambers may have written "a plethora of trash appalling in its scope" (as Joshi says, Lovecraftingly) but he was also capable of much, much more. The Chaosium collection begins, appropriately, with The King in Yellow, which is made up of "The Repairer of Reputations," "The Mask," "The Court of the Dragon," "The Yellow Sign," "The Demoiselle d'Ys," and "The Prophets' Paradise." There were originally four additional stories which apparently deal with the Franco-Prussian War and were left out of this edition. According to the Wikipedia article, these do not continue with the macabre themes of the first four and reflect the romantic style characteristic of Chambers's later (and much-maligned) output. There is always going to be controversy surrounding abridged v. unabridged, but in this case I feel that Joshi made the right choice. The result is tighter and more intense. "The Repairer of Reputations" makes for a strong opening and it is here that we learn most of the history of The King in Yellow, including some of its characters, the presence of the Pallid Mask, the power of the Yellow Sign, and the havoc the play wreaked in Europe, where it was denounced even by the most radical advocates of literary freedom. The setting is then-future 1920 in New York City, which has achieved a near-utopian splendor reminiscent of Edward Bellamy's Looking Backward. Until you realize the impossible perfection ("after the colossal Congress of Religions, bigotry and intolerance were laid in their graves and kindness and charity began to draw warring sects together. . .") tinged with menace (the grand opening of the "Lethal Chamber" for suicides) seems to better reflect a disturbed mental state, in the manner of Edgar Allen Poe's "The Haunted Palace." Although Chambers lacks Lovecraft and Poe's overwrought half-hysteria, Hildred Castaigne is clearly a madman and established from the start as an unreliable narrator. (Poe was another of Lovecraft's favorite writers.) Hildred believes himself to be a direct descendant of Carcosa's royal family and is plotting a coup along with Mr. Wilde, a malformed recluse with artificial ears who claims the loyalty of many prominent men whose reputations he successfully salvaged. But what parts of this improbable scenario are actually real is uncertain. Nearly all the characters in all the stories agree on the existence of a dangerous play called The King in Yellow but beyond that, dream and reality are indistinguishable. 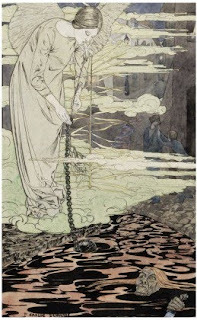 "In the Court of the Dragon" begins and ends in pure subjectivity: from the narrator sitting in church, then leaving to escape the dissonant organ and its sinister player (both of which only he seems to notice, leading him to doubt his own perceptions), only to find himself back in the same place as though he never went anywhere. The painter and his model in "The Yellow Sign," meanwhile, are plagued by prophetic nightmares of their doom at the hands of the very figure they dreamed of. The Phantom of the Past would go no further. "If it is true," she sighed, "that you find in me a friend, let us turn back together. You will forget, here, under the summer sky." I held her close, pleading, caressing; I seized her, white with anger, but she resisted. "If it is true," she sighed, "that you find in me a friend, let us turn back together." "The Green Room" likely recalls the Pallid Mask but the others are just ambiguous. Their inclusion in The King in Yellow suggests an intuitive association left to the individual reader to discern. If that is the case, then Chambers may also be asking us to take dream-perception into consideration, whether in the form of delusion or hallucination (particularly in "The Repairer of Reputations," which could link it to "The Demoiselle d'Ys" as another fantasy taken for material reality) or as another way to understand and engage the events of our lives. This proto-Surreal, otherworldly quality is reinforced by Chambers's skillful evocation of atmosphere. The stories of The King in Yellow unfold with the languid, decadent air of opulent mansions, Parisian antiquity, and the seclusion and creative freedom of the artist's studio. With the exception of the comical "In Search of the Unknown" series, the majority of the stories are resplendent with similarly rich, sensuous images of art, nature, and beauty. The twilight deepened; out of the city the music of bells floated over wood and meadow; faint mellow whistles sounded from the river craft along the north shore, and the distant thunder of a gun announced the close of a June day. The end of my cigarette began to glimmer with a redder light; shepherd and flock were blotted out in the dusk, and I only knew they were still moving when the sheep bells tinkled faintly. "Aké u, aké u, aké u!" But the magic half second shall never return. What that means is anyone's guess, although it's expanded further in "The Mystery of Choice: The Key to Grief," about a castaway who may or may not have dreamed of his year-long marriage to an enigmatic island native. Robert Chambers's stories are strange all right. But they are also gorgeous. Unfortunately, S.T. Joshi claims that the influence of Robert W. Chambers on ensuing generations of writers does not seem to extend beyond a borrowing of names. Lovecraft's cosmic outlook, Joshi argues, and not to mention his interest in dreams and use of the Brown Note concept (with the Necronomicon), were already well-established before he read Chambers in 1927. Indeed, Lovecraft's reliance on overheated prose, mind-bending monsters, and hints of sanity-shattering horror is far removed from the dark elegance that infuses Chambers's best speculative works. The King in Yellow stories are still of quite worthwhile for any Lovecraft fan intrigued by the allusions made to Hastur and the Yellow Sign in "The Whisperer in Darkness" and Lovecraft's essay "Supernatural Horror in Literature." But Chambers's appeal goes well beyond a single niche. While scholarship on Chambers may be frustrated by his mountains of maudlin madness, I believe this Chaosium edition will engage anyone looking for something wonderful and unusual and in need of a wider readership. Strongly recommended. I looked at her guiltily, already ashamed of myself for encouraging her to her destruction. How lovely and innocent she appeared, standing there reading her notes in a low, clear voice, fresh as a child's, with now and then a delicious upward sweep of her long, dark lashes. With a start I came to my senses and bestowed a pinch on myself. This was neither the time nor the place to sentimentalize over a girlish beauty whose small, Parisian head was crammed full of foolish, brave theories concerning an imposition which her aged sovereign had been unable to detect. The woman in question is the sole female representative on an elite scientific panel of leading international ornithologists. But I found these passages more amusing than anything else. All the works are well over a century old, so what can we expect? The depiction of the Chinese in "The Maker of Moons" is also quite racist ("a horrible human face, yellow and drawn with high-boned cheeks and narrow eyes") but still not as bad as anything Lovecraft put out. You MUST read Lovecraft! He's been an enormous influence on just about every horror writer since. Peter Straub edited a great collection for the Library of America but you can also find his works online. At least read "The Call of Cthulhu," which is his most famous. My favorite is "The Shadow Over Innsmouth."